Repurposed Drugs: A Shortcut to the Discovery of Novel Antidepressants? Shared Pathophysiology between Depression, Obesity and Metabolic Disturbances: Novel Antidepressant Targets? In spite of the undeniable progress of Psychiatry over the past 60 years, and hundreds of new molecules having been tested for the treatment of mental disorders, the pharmacological treatment of depression is far from being satisfactory. In the last decades, no significant paradigm shifts in the psychopharmacology of mood disorders have occurred, mostly because the development of novel antidepressant agents is limited by our limited understanding of the pathophysiology of the illness. In this context, Andre F. Carvalho, Gislaine Z. Reus, and João Quevedo have devoted their talent and effort to provide us with a crisp summary of the past, present, and future treatment options for the management of depression that will please both preclinical and clinical investigators in neuropsychopharmacology. This e-jewell, rather than e-book, (and its printed version) gathers prominent researchers in basic and clinical psychopharmacology, authoring thoughtful chapters on exciting topics such as animal models, optogenetics, endophenotypes, repurposing, cognitive dysfunction, biomarkers, oxidative stress, and the microbiota-brain axis, which are outstandingly relevant for understanding the current approach to the pathopshysiology of mood disorders. 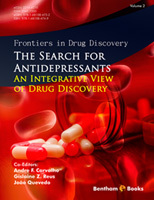 Modern and traditional treatment targets, such as glutamate receptors, monoamine-oxidase-A, intracellular signaling pathways, and new avenues based on the comorbidity between depression and metabolic syndrome, neuropeptides, or herbal remedies are also part of this comprehensive text which starts with a wonderful chapter on innovative solutions for the development of new antidepressant drugs. I personally enjoyed reading it and learnt much from it. In difficult times such as ours, when social and methodological hurdles are challenging our ability to translate scientific progress into true impactful innovation in this field, the reading of this book fuels fresh air into the community of scientists, clinicians, and perhaps informed patients who await answers or at least better questions for the understanding and management of depression. This eBook was conceived after an invitation by the Bentham Science Publishers due to the necessity to review novel antidepressant alternatives. The prevalence of people with major depressive disorder (MDD) has increased drastically worldwide. In addition, many patients do not respond to classic antidepressant treatments. However, in the last years, new strategies have been studied in experimental and clinical approaches. The development of novel treatment of MDD would decrease the morbidity and mortality, and consequently the economic burden associated with hospital. Some of these new treatment alternatives are associated with a fast antidepressant effects and low side effects compared to classical treatments. Several studies indicate that pathological mechanisms involved with MDD development are not only based on monoaminergic system, but also with metabolic disturbances, inflammation and a decrease in protein involved with neuroplasticity. This eBook aims to contribute to an integrated understanding concerning innovative alternatives to treat MDD. It is based on cutting edge research and the outcome will shed light on the most appropriate approach to treat resistant-treatment MDD patients. It gathers a wide range of topics on the subject and includes several chapters with original material. Authors and co-authors represent a multidisciplinary team that includes scientists and professors with a vast experience in the area, from different universities and research institutions. It is an attempt to encourage the implementation of alternative approaches to the classic antidepressants for humans. The eBook is organized in fourteen chapters: the general introduction is followed by a review devoted to experimental models, optogenetics therapy, the role of healthy human volunteers, monoamine oxidase-A, repurposed drugs, glutamatergic compounds, cognition, oxidative and nitrosative stress, melatoninergic pathway, neuropeptides, gut microbiota, metabolic disturbances, and plant-based drugs. Ultimately, we would like to thank all authors that have actively contributed to this eBook, and all people that someway helped us to bring it to daylight, including our family, friends, students and colleagues.